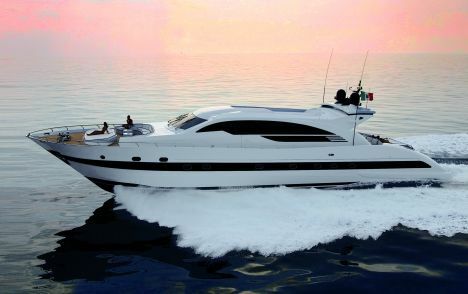 Here's another yacht from the 46th Genoa Boat Show, a Tecnomar 30 metre which is the fifth model of the Tuscan yard's Velvet opens, including open motoryachts in composite between 20 and 35 metres. Shafting line transmission with V-Drive. 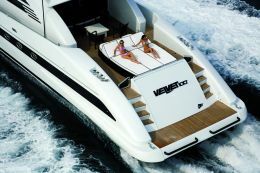 The interiors of this Velvet 100 are by Luca Dini, one of the most acclaimed Italian designers of the moment and, moreover, the signature behind many of the Viareggio brand's various motoryachts. He is therefore largely the originator of the style that Tecnomar is offering the market. From the aesthetic viewpoint the boat in question, designed by the yard, maintains intact the family feeling expressed by the yard in recent years, characterised by a sporty look - the brand essence - emphasised by the now unmistakeable accentuated thrust of the bow, the dark strips enveloping the sides and the pronounced incline of the windshield which is all of a piece with the side uprights and hard top. The latter can be requested with power assisted opening or can be used as a sort of sundeck for tan-lovers. But there is no lack of space for them elsewhere aboard since there are two special areas on deck. Thanks to the generous beam, a really broad sunbathing zone has been situated forward, integrated into the forms of the large semicircular dinette set into the deckhouse. This space can be transformed into an outdoor dining area seating ten. The cockpit sunbathing zone is more compact, set against a rounded transom which, together with the sides, reprises the rake of the bow. Further aesthetic personality is given by the progression of the uprights which in side view form a single long arch that runs from bow to stern. Standing out against the stern, the aerodynamically profiled spoiler serves as an aerial holder but also of cockpit. Lastly, the dimensions of the lateral gangways are worthy of note, favoured by the restrained volumes of the deckhouse: they can be easily and safely used even at speed. The flooring is teak, like the rest of the deck, bridge included. For the interiors the Tuscan designer has chosen fashionable solutions, personalised above all by a refined décor which presents a tangible but never shrill elegance. 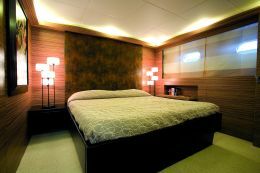 Where leather, wood and fabrics are employed sometimes even in a "bold" manner, but with choices backed up by a lighting system that was designed ad hoc for these interiors and is therefore capable of highlighting every detail while at the same time creating the right atmospheres. Emblematic of this is the ceiling in the saloon on the main deck, and again in the adjacent dining area and the cockpit area farther forward. In this case Dini has chosen a facing in brown leather panels, which might lead us to assume a negative effect on the brightness of the interiors. But on visiting the boat this proved to be quite untrue, thanks to adroit exploitation of the play of direct or diffused lighting. The dark ceiling is contrasted by the flooring and sofas, also in leather but this time light-coloured, which provide an extremely convivial living area. Another special feature is the choice of wood for the facings: Zebrano, from Central Africa, is a wood whose nuances of colour go well with contrasts and whose long and evident longitudinal grain emphasises the depth of the spaces. Two separate stairways lead from the deck to the crew's quarters and the guest cabins on the lower deck, which is entirely occupied by the night zone. 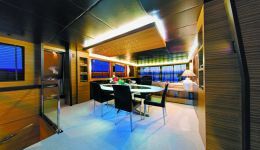 The layout gives the most substantial volumes to the owner's rooms fully aft. We say rooms because, in effect, over and above the full beam cabin with central double bed and dressing table on the port side, the owner also has a spacious bathroom with separate shower unit and a truly walk-in dressing room. The two symmetrical guest cabins amidships are practically identical in size and furnishings, with twin beds, wardrobe and bathroom with shower. Right opposite the stairway from the deck there's a large daytime guest bathroom. 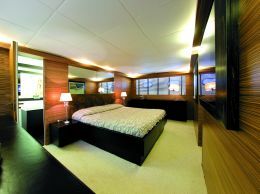 The VIP cabin, farther forward on the starboard side, is decidedly larger, with double bed and spacious bathroom. 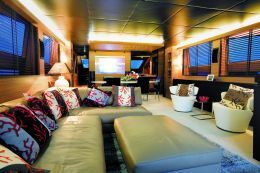 As we said, the crew area is well separated by its own access which leads first to the galley - with a service dining area - and then to the cabins, three with two bathrooms, in the forepeak. 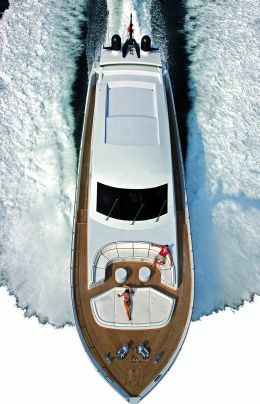 On a purely technical level, the boat was built on the basis of a variable V hull which, thanks to the powerful thrust developed by 2 x 2.050 MTU engines, planes at half load at a maximum speed of 32 knots, with a cruising speed around 27 knots. For those who want to go faster there's also a version with more horsepower (2 x 2.450 HP) that can reach a maximum of 37 knots with a cruising speed of 31. The yard has taken great care - another striking Tecnomar trademark - in the creation of all on-board plant and systems: both those regarding the well-being of guests and crew, and the ones that are concealed to most, such as the engine room fully aft on the lower deck for the installation of V-Drive transmissions, and other systems throughout the vessel. A special feature worth mentioning is the use of fuel tanks in light alloy, of great capacity and fixed longitudinally to the hull, with the aim of better weight distribution but above all to have the weight of the fuel as low as possible, thus favouring the vessel's static and dynamic equilibrium.